Salvatore Accardo is regarded as one of the most prominent solists and conductors on the international music scene. He made his debut at the age of 13 years old with Paganini’s ‘I Capricci’. He won the Concorso di Ginevra when he was 15 years old as well as the Consorso Paganini in Genova in 1958. His vast repertoire extends from baroque to contemporary music. Composers such as Sciarrino, Donatoni, Piston, Piazzolla, Xenakis have dedicated works to him. He regularly performs with major orchestras and the most important conductors on the international music scene as both soloist and conductor. He established specialization courses in music for young talent at the Fondazione Walter Stauffer in Cremona with Bruno Fiuranna, Rocco Filippini and Franco Petracchi in 1986. 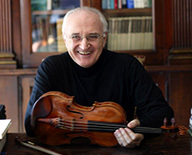 In 1982 he founded the Quartetto Accardo, and in 1996 he re-established the Orchestra da Camera Italiana (OCI), made up of the best students and ex-students of the Foundation. The OCI is a unique example of an orchestra whose members come from the same School for Strings, they perform with an expressive technical and stylistic unity that has no equal. Salvatore Accardo has a busy schedule of concerts and recordings with the Orchestra da Camera Italiana. In 1987 Accardo made his debut as a Conductor to great acclaim and subsequently acted as director of the Opera di Roma, Opera di Monte Carlo and Opéra di Lille, at the San Carlo theatre in Naples and at the Rossini Festival in Pesaro as well as taking part in numerous other symphonic concerts. He has made many much-admired recordings for several record labels including Deutsche Grammaphon, Philips. ASV, Dynamic, EMI, Sony Clasical, Collins Classic and Foné. He has also been awarded many prestigious prizes and awards; In 1982 he was made a Cavaliere di Gran Croce by the President of the Republic Sandro Pertini, in 1985 he recieved the Music Critic’s award the Premio Franco Abbiati, and in 2002 he was awarded the prestigious ‘Una vita per la Musica’ prize. He owns the Guanieri del Gesù violin (ex ‘Hart ‘1730).